Anti-retaliation and whistleblower laws protect employees who report certain types of misconduct or legal violations by their employers. There are numerous laws that protect whistleblowers in Georgia from being retaliated against by their employers for bringing such issues to light. Refused to engage in conduct that would violate the law, when requested by your employer to do so. You must also show that, following your protected activity, you suffered an adverse employment action at work, and the adverse employment action was caused by your protected activity. If you feel you have been retaliated against for whistleblowing, we recommend that you contact Fidlon Legal immediately for an initial case evaluation. Many of the whistleblower protection laws have very short statutes of limitations—as short as 30 days. Our attorneys are experienced at handling whistleblower and retaliation claims in Georgia, and will analyze your facts to determine whether you have a valid claim, and then assist you in getting the relief you deserve. The Sarbanes-Oxley Act (SOX) applies to publicly traded companies and their subsidiaries with the goal of protecting shareholders from fraud. SOX has a whistleblower provision which protects employees who expose public companies for artificially inflating their stock values, misleading the public, or violating federal securities laws. In 2010, the Dodd-Frank Wall Street Reform and Consumer Protection Act (Dodd-Frank) was enacted. Dodd-Frank amended SOX in several respects, significantly increasing the protections available to whistleblowers in the financial services industry. An employee who prevails under Dodd-Frank may receive up to twice the amount of wages lost due to retaliation, as well as attorneys’ fees. Dodd-Frank also allows for a whistleblower to receive cash awards between 10% and 30% of amounts that the SEC recovers based on the whistleblower’s report. The False Claims Act (FCA) allows private citizens to sue those that commit fraud against federal government programs. The FCA provides for up to treble damages and also provides awards of 15% to 30% of recoveries for those bringing cases. If an employee is fired, suspended, demoted, harassed, or otherwise discriminated against for filing a FCA suit, or bringing FCA violations to the employer’s attention, the law provides for reinstatement, double back pay, and compensation for special damages, including litigation costs and reasonable attorneys’ fees. The Whistleblower Protection Act (WPA) provides statutory protections for federal employees who disclose illegal or improper government activities. The protections of the WPA apply to most federal executive branch employees and become applicable when an adverse personnel action is taken because of a protected disclosure made by a covered employee. Similarly, the Georgia Whistleblower Act (GWA) protects public employees who blow the whistle on state and local government misconduct. Protected activity under the GWA includes complaints disclosing fraud, waste or abuse of state or local government funds or property. Like the FCA and the WPA, the GWA makes it illegal for a government employer to discharge, suspend, demote, harass or take any other adverse employment action against an employee because s/he has made a covered whistleblower complaint. The U.S. Department of Labor’s Occupational Safety and Health Administration (OSHA) administers the Occupational Safety and Health Act and a number of other laws protecting workers against retaliation for complaining to their employers, unions, OSHA, or other government agencies about unsafe or unhealthful conditions in the workplace, environmental problems, certain public safety hazards, and certain violations of federal provisions concerning securities fraud, as well as for engaging in other related protected activities. 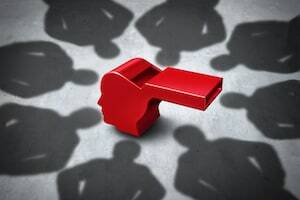 Whistleblowers may not be transferred, denied a raise, have their hours reduced, or be fired or punished in any other way because they have exercised any right afforded to them under one of the laws that protect whistleblowers. Reinstatement, which includes returning you back to the same position you held before the retaliation or to an equivalent position with full fringe benefits and seniority rights. Back pay, which includes payment of lost wages, benefits, and other remuneration to cover the time you were not working. Compensatory damages, which includes money to compensate you for damage to you for emotional distress, pain and suffering, inconvenience, and loss of enjoyment of life. Attorneys’ fees, which includes paying your attorneys’ hourly fees, court costs, and expenses. Standing up to your employer or the government takes courage. If you feel you have been retaliated against for reporting illegal or improper conduct at work, we can help you fight back. Contact the Atlanta retaliation and whistleblower lawyers at Fidlon Legal right away for an initial case evaluation.